Persistence Market Research’s recently published research study on the industrial burners market, titled 'Industrial Burners Market: Global Industry Analysis 2013 - 2017 and Forecast 2018 - 2028', offers a detailed value-volume analysis of the industrial burners market, along with insights via BPS analysis in (US$ Mn), market attractiveness analysis, and Y-o-Y growth on the basis of burner type, burner design, application, fuel type, and end-use industry. The volume analysis for the industrial burners market has been considered in units (number of industrial burners), covering data for the historical period ranging from 2013-2017, and forecasted period up to 2028, with 2017 as the base year. In addition to the quantitative analyses provided by market size estimates and growth trends, the report on the global industrial burners market also provides qualitative analysis in the shape of market dynamics, such as drivers, restraints, trends and opportunities, forecast factors, macroeconomic factors, market definition, Porter's analysis, and other factors that influence and impact the global industrial burners market. The report on the global industrial burners market aims to provide insights with regards to market size and its associated development for the interested stakeholders. Marketing and business intelligence has been facilitated through information based on competition landscape, business strategies, technology roadmap, and list of market participants with relevant information on industrial burners. PMR has not only presented the research findings but also has added suitable recommendations and market dynamics that can be helpful for market entry, business development, and sustenance in the industrial burners market space. For a comprehensive understanding of the industrial burners market in the finest possible way, the report has been categorically segmented into a multitude of categories on the basis of burner type, burner design, application, fuel type, and end-use industry. Market size estimation and analysis have been provided on a global level as well as by prominent regions and associated countries of North America, Latin America, Europe, South Asia, East Asia, Oceania, and the Middle East & Africa. The first section of the industrial burners market report includes the market introduction/definition, wherein, product definition, taxonomy, and market definition by segments where significance and utility scope of each sub-segment has been briefed. The market definition also provides an outline of research assumptions/ limitations binding on the research study, on the basis of which the entire framework has been devised. The second section of the global industrial burners market report includes macroeconomic factors along with value chain analysis, drivers, restraints, trends, and opportunities that have a profound influence on market growth. The information has been backed up with suitable examples and facts as obtained from official and authentic data credentials. In the subsequent section, the industrial burners market viewpoint has been covered, which includes global value and volume analysis. The report provides significant information pertaining to the above-mentioned segments in the global industrial burners market. The final part in the market background is included in the forecast factors, which includes a study of the factors that are expected to have an impact on the industrial burners market, such as technological growth, investments, and other key insights pertaining to the market. A section dedicated to the pricing analysis of industrial burners has been provided on the basis of burner type on regional fronts, whose weighted average selling price has been computed to arrive at global average prices. This pricing analysis provides pricing by each configuration. Assumption and key considerations for the same have also been elucidated. The sections that follow consist of the global industrial burners market analysis by burner type, burner design, application, fuel type, end-use industry, and region/country. The overall analysis of the industrial burners market begins with overall global market assessment, followed by the analysis of numerous regions citing the macroeconomic environment of the particular region. Each regional section of the report contains qualitative data and quantitative aspects of the global industrial burners market. In the final section of the report, we have provided a competition analysis with company market share analysis pertaining to industrial burners, and the performance of manufactures by tier. In the competition dashboard section of the global industrial burners market report, we have provided a dashboard view of major players, along with market share and their key business strategies. This helps clients understand the strategies deployed by market players, and allows them to develop effective strategies accordingly. The first stage of research includes the formulation of a primary hypothesis, which was gathered from primary as well as secondary approaches. The subsequent stages involve the triangulation of data gathered from two approaches. For the final data analysis of the industrial burners market, we have considered 2017 as the base year, and basic data was collected from public sources as well as sources such as company’s annual reports, investor presentations and press releases, World Bank Statistics on revenue sales, newsletters, published reports on the public domain, industry association’s reports, and paid databases on finance and corporate information. The collated data from these sources was further validated from product manufacturers, distributors, end-user procurement agencies, and regional representatives. For market estimation, we have considered both, the demand-side as well as supply-side drivers and trends. Historical data includes data for the period 2013-2017, and forecast estimation for the period 2018-2028. We have considered product and technology developments, market trends, mergers and acquisitions, and strategic developments among the manufacturers of industrial burners. The forecast presented in the global industrial burners report evaluates the actual market size (US$ Mn) in 2017 with regard to the product (industrial burners), and the expected market value in the global industrial burners market over the forecast period. Moreover, the report shows the market attractiveness for the upcoming ten years. This market attractiveness value helps clients identify real opportunities in the global industrial burners market. Further, we also considered the mandated industry standards and regulations of industrial burners for every region. Furthermore, to analyze the market share and competition analysis, we tracked key company developments such as collaborations, expansion, mergers & acquisitions, new orders, product launches, awards, and recognition. For market share and tier analysis based on key and regional players in the industrial burners market, we collected the data from annual reports published by the manufacturers of industrial burners, and estimated the market share of players on the basis of the distribution of the product at a regional level. Competition benchmarking has been provided for the top 5 competitors with respect to sales performance of industrial burners. An industrial burner is a mechanical heating device that uses different types of fuels for high-temperature heating. Some of the commonly used fuels in industrial burners are oil and gas. Industrial burners that use a combination of oil and gas are also available. The global industrial burners market continues to be influenced by a slew of macro- and micro-economic factors. While focus on improving operational efficiency and reducing the level of emissions continues to foster investments in research and development, the demand for high-volume, low-cost burners remains a pervasive trend in developing countries. The global industrial burners industry is in a phase of transition, as factory automation and integration of smart components is hard-pressing burner manufacturers to adapt to a rapidly changing landscape. Advances in robotics and automation will continue to have an impact on the manufacturing and application of industrial burners. In the present scenario, manufacturers are adopting a dual-focus approach – catering to the imminent needs of end users without losing sight of the broader changes that lead to transformation and disruption. Among the imminent needs, the demand for high capacity industrial furnaces that offer easy installation continues to remain a priority for end users. The changing regulatory landscape, especially the guidelines pertaining to capacity regulation modulations, continues to create ambiguity, thereby hindering the prospects of many manufacturers. The integration of burner automation and the influence of aerodynamic designs will create growth opportunities for players who are willing to adapt to the ever-evolving end user demand. The global industrial burners market is estimated to grow at a value CAGR of 4.4%, reaching a market value of US$ 8.4 Bn by the end of the forecast period. 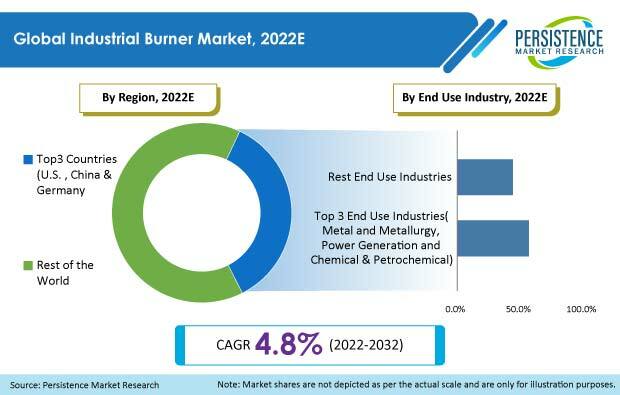 Growth in various end-use industries owing to expansion and new establishments in order to cater to the growing demands are the key factors that are projected to drive the growth of the industrial burners market during the forecast period. On the basis of application, the boilers segment is anticipated to remain a very attractive segment in the global industrial burners market. This segment is also projected to grow at a healthy CAGR of 4.9% during the forecast period (2018-2028). Moreover, the segment is also estimated to hold a noteworthy share in the global market by the end of 2018. On a regional level, the market in South Asia is expected to grow at a healthy growth rate in the global industrial burners market, owing to the rising awareness pertaining to emission-less industrial burners. The attachment of these burners will also enhance the overall efficiency of the end users. However, the market in North America is projected to retain its dominance in terms of market share throughout the forecast period. The global industrial burners market is highly fragmented, owing to the presence of a large number of global multi-national companies, as well as a large number of local manufacturers across various regions, especially in India, China, and Europe. The presence of numerous domestic as well as global market leaders in the industrial burners market has led to a competitive environment for manufacturers. Established players are estimated to account for approximately 40% of the industrial burners market share, while the rest are estimated to account for approximately 60% of the total market share. A few of the key global market leaders in the industrial burners market are Honeywell International, Inc, Weishaupt Group, Forbes Marshall Private Limited, Baltur S.p.A., and Andritz AG, among others. Prominent players in the global industrial burners market are launching low NOx emission type industrial burners in order to adhere to strict regulations pertaining to a clean environment. Moreover, industrial burner component manufacturers are highly focused on supplying burner management systems to boiler applications in the global market. How is the industrial burners market expected to grow over the projected period? What direction is the industrial burners market expected to take in terms of volume and value during the forecast period? How are macro-economic factors affecting the growth of the industrial burners market? What are the key market drivers in the industrial burners market? What are the important opportunities and improvement areas for industrial burner manufacturers? What are the key developments and trends taking over the industrial burners market? Which are the emerging countries that are expected to create significant growth opportunities in the industrial burners market?